It’s common knowledge that finding work or even a place to stay is not easy for a person with a criminal record, even after serving the time and changing their lifestyle. Getting help from others to start over may not be the easiest thing to do either. 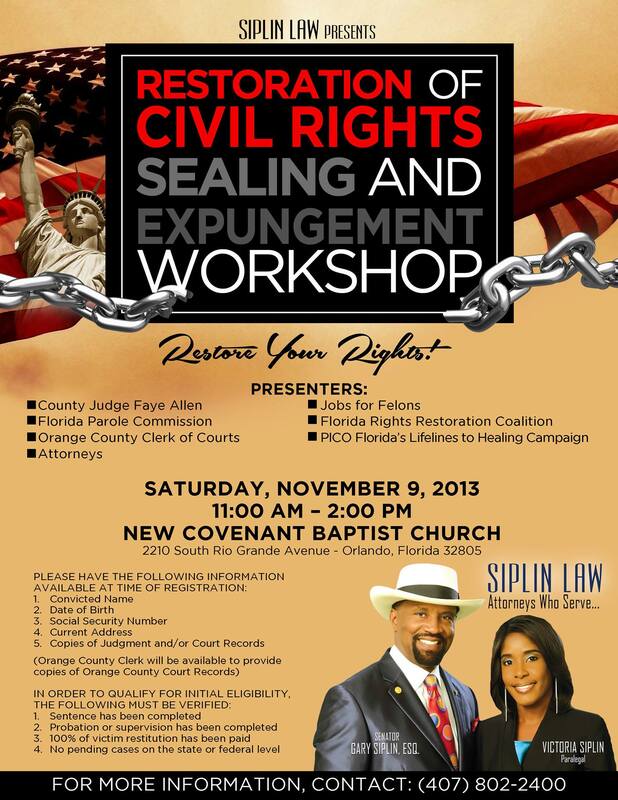 However, on this Saturday, Nov. 9, Gary and Victoria Siplin will join a team of experts in sharing information about restoring civil rights and expungements. The two are sponsoring a free rights restoration workshop from 11 a.m. to 2 p.m. at the New Covenant Baptist Church, 2210 S. Rio Grande Ave., Orlando, FL 32805. The workshop is open to the public and anyone needing help with restoring their rights are encouraged to attend, especially since there have been changes made to state clemency rules under Governor Rick Scott’s tenure. This is an opportunity for folks with records to find out their current status and get the help they need to attempt to restore their rights. It’s a process, Victoria Siplin said. Participants will be able to talk with parole and FDLE officials, along with a judge who can help with completing the required paperwork. She said the workshop is being held in response to daily calls and visits the couple gets to their law office, on the issue. For details on the workshop, call 407-802-2400. This entry was posted in Community news that can help, Faith and Family, Work and tagged Ex Felons, Expungement, Find Jobs, Gary Siplin, New Covenant Baptist Church, November 9, Orlando, Restoration of Rights Worshop, Saturday, Victoria Siplin. Bookmark the permalink.